Building heating and cooling control systems are independent systems that coordinate the building heating and cooling systems to create a pleasing, safe, and healthy environment for activities in the facility. Control systems come in various types and levels of sophistication; however, the desired result is a facility where the environment is comfortable, and that comfort is achieved at the lowest possible energy cost. As modern facilities and available technology have evolved, control systems have grown in sophistication. Current systems coordinate comfort, manage energy use, report problem areas, and coordinate information to assist facilities managers in facilities operation. Control systems in university facilities differ significantly from those found in homes and small commercial buildings. University facilities are complex. Continuous and variable thermal and moisture loads occur. Loads change throughout the day, based not only on the weather but also on the influx of people and activities. In the commercial environment, there is continuous exhaust of contaminated air to ventilate for the occupants. There is a higher expectation for comfort than people expect in their homes. There is also a need to minimize the cost to operate the building systems. For these reasons, the heating and cooling systems in facilities have evolved to a high level of complexity. As systems have evolved, the need to coordinate the environmental systems has evolved. Control systems in buildings all have a common concept, known as sensor to controller to controlled device, or feedback. A control system is assigned to a building function, such as temperature, humidity, pressure, or cleanliness of the building environment. For example, the process of controlling a room's temperature is a typical and frequent occurrence in a building. To control a room, we must have something that can determine the temperature of the room, a sensor. But the room temperature is all the sensor determines. There is a need for a device to determine a set point (the desired temperature) and to determine how quickly and in what direction a change will occur if needed (how to get the desired temperature). This device is the controller. In the case of the control of a room's temperature, the device most often used is a thermostat. The thermostat is a sensor and a controller in one device. The sensor and controller cannot create a comfortable environment without a controlled device. A controlled device is the mechanism that actually causes a change in the environment. It may be an automatic valve or an electrical switch; it may be an airflow controller. In this example, it is the device that regulates the heating or cooling of the room. Imagine driving your car with a blindfold over your eyes. The odds of getting to your destination would certainly be poor. As we drive, we make adjustments to keep the car on course. This is feedback. Control systems must also have feedback to be effective. In the case of building control systems, we need to measure the result of a change that has been made. If the thermostat we used in the prior example was not in the room we were controlling but instead was in the garage, it would not be effective at providing comfort in our room. It would certainly sense the temperature and signal the controlled device, but without measuring the controlled area, without feedback, it would be ineffective. Another fundamental of control in buildings is coordinated operation. Again, we will use the example of an office with a thermostat. In our example, we have a heating device at the exterior wall and a unit to cool the room. Imagine if we had the cooling system running when it was cold in the room and the heat at full output when the room was warm—not a comfortable thought. Alternatively, imagine if the heating and the cooling operated at the same time. Not only would there be questionable comfort, there would also be a tremendous waste of energy and dollars. A control system coordinates the operation of the system equipment with the need. If the room is cool, then heat is introduced. If the room is warm, then cooling is introduced. When the room is comfortable, the systems are shut down. At the level of a single room, the entire building, or the campus, the building control systems coordinate the operation of systems to maintain comfort, and optimize equipment operation and energy consumption. To understand where we are today, it is worth reviewing where we have been. As buildings grew in sophistication, a need developed to control the environment. Early buildings were small, were not cooled in summer, and were heated in winter with stoves or fireplaces. Early control systems were not automatic and were designed to limit the rate at which coal or wood burned in the stove. As the Industrial Revolution progressed, buildings grew larger, and individual fireplaces and stoves became unworkable. To overcome these shortcomings, designers put in steam heat as a means to heat spaces, and individual windows for daylight, cool air, and ventilation. Now a fire could be stoked in one location, and the heat from the fire could be distributed. The distribution of heat created the need for the first control system. A first system involved the use of a bell. When an occupant in a room was too cold, he or she would give the bell a loud ring. The fire stoker would increase the amount of heat flowing to the room by manually adjusting a valve. In 1885, Professor Warren Johnson of Milwaukee, Wisconsin, discovered that certain metals bend in a peculiar way in the presence of heat. Professor Johnson saw that these metals could provide for automatic temperature sensing. When he combined a metal temperature sensor with an electrical switch, he created the first automatic temperature control: the thermostat. When he connected this new sensing device to a controlled device, an electric bell, he developed the first automatic control system. Thus, when a room was cold, the thermostat could automatically ring the bell. As building size and sophistication increased, new systems were included in designs. Early buildings allowed each person to be near a window. However, the widespread use of electricity in buildings soon brought numerous changes. Larger buildings were created with interior spaces without windows, and thus building designers needed to provide fans for ventilation. Electric motors were coupled to valves that had previously been operated manually. Thus, the electric thermostat could operate the valve directly and automatically, eliminating both the bell and the fire stoker. Control systems were no longer a luxury but were becoming a real need in buildings. In these early systems, the controls operated controlled devices in an "on-and-off" manner (two-position control). When a room was cold, the heat was on to the maximum amount. When the desired temperature was reached, the heat was entirely off. This resulted in widely fluctuating temperatures that would be unacceptable by current standards. However, it was a significant advance in the early years of the 20th century. These widely fluctuating temperature conditions, particularly in mild weather, resulted in a need for better control. There was a need for systems that could put a small amount of heat in a room when there was a small need for heat. To respond to this need, pneumatic controls were introduced, and the concept of proportional control (which gradually opens or closes the controlled device in response to the gradual change in the sensed variable) was developed for heating and cooling controls. Pneumatic controls were a response to the need for proportional control, as well as the need for lower costs. Although electric actuation was possible, its cost was prohibitive. Air-operated pneumatic controls could be made inexpensively and could offer proportional control. Proportional control was truly a breakthrough in control systems. New types of controlled devices were needed to accomplish proportional control. It was found that certain metals could withstand repeated flexing without breakage. These metals were formed into designs similar to fireplace air bellows and were known as sylphons. Sylphons could utilize a low pressure air supply, typically 15 lbs. per square inch gauge (psig. ), and incrementally position a controlled medium (e.g., the flow of water in a pipe or the flow of air through a duct). With the advent of sylphons, the need for pneumatic thermostats became evident. Pneumatic thermostats were developed around 1910. These devices also utilized metals that bent when heated, but instead of snapping an electrical switch, they allowed compressed air to gradually escape. The escape of compressed air was linearized to correspond to sensed changes in temperature. The result was an air pressure output from the thermostat that changed gradually in proportion to the sensed variable. These devices were the beginning of pneumatic proportional controls, which are still in use today. The relatively low cost of pneumatic controls allowed a much wider use of controls in buildings. Temperature control became a standard in buildings, and controls for other environmental needs were developed. For example, it was becoming apparent in northern climates that the introduction of humidity into a space would increase comfort, as discussed in the BOK's Building Mechanical Systems chapter. Sylphons were available that could gradually control the introduction of steam or water into the air. However, there was a need for a sensor and controller that could regulate moisture in the air. It was found that there were materials that could change their physical dimensions when subjected to moisture in the air. These materials—human hair, animal bone, animal horn, and wood—were the foundation materials in the development of the hygrostat, the product currently known as the humidistat. An additional major development in pneumatic controls was the development of capillary sensing. As buildings grew in size, space heating, humidification, and ventilation were accomplished with centralized systems. Room-type thermostats were inadequate to sense air conditions in ducts and certainly could not be mounted in pipes to sense water temperatures. The capillary sensor was a means of using small-diameter metal tubing, attaching a small-bellows sylphon to one end, and filling the tubing with a liquid or gas that would expand or contract in relation to the sensed temperature. This change in volume as a result of expansion caused the bellows sylphon to move. The motion could then be used to control the leakage rate of air from a controller to achieve proportional pneumatic signals. Similarly, controllers with external humidity sensors were developed to sense duct humidity. Remote sensor controllers were developed for sensing the temperature of water in pipes. Additional sensor controllers were developed for pipe and duct pressure sensing. There was now a complete array of tools to sense and control building environmental conditions. Armed with this wide array of control tools, building systems grew in complexity. Although early buildings may have had one thermostat for the entire building, modern buildings of the pneumatic period had individual thermostats for each room and thermostats and humidistats for central air and water systems. Major companies such as Johnson Service Company, Minneapolis Honeywell Regulator Company, Powers Regulator Company, and Fulton Sylphon Company grew and became major suppliers to the building industry. The quality of controls began to increase with the development of a controls industry. Improved accuracy of control was needed. Early sensor controllers, typically known as regulators, were first-order response devices. First-order devices do not have an internal mechanism to produce controller feedback. This type of controller creates a difference between the desired result (the set point) and the actual result; this difference is known as offset. Also, the speed with which controllers could respond typically was limited to achieve stability. When these devices were applied to systems that frequently experienced wide variations, response was slow and unstable. The market responded with the creation of second-order mechanisms. Second-order feedback-type controllers were developed in the early 1920s. They went on to become the industry standard for pneumatic controllers into the 1990s. Second-order controllers use internal feedback of the output signal to adjust the output signal. If there is a great need for output, the output is allowed to go to maximum. As the sensed variable approaches the set point, the feedback loop slows the output. Typically, the rapid output changes cause the sensed variable to go beyond the controller set point; this is known as overshoot. The controller then responds by rapidly diminishing the output to achieve set point. Second-order controllers gave users more accuracy by diminishing offset and provided a quicker response, which improved stability. In modern terminology, increased speed of response is known as derivative control (rate based) and the elimination of offset is known as integral control (time based). Thus, modern controllers can incorporate proportional-integral-derivative (PID) control. This is explained further later in the section. In the early 1960s, building complexity continued to increase. Building size continued to grow, both vertically (the skyscraper) and horizontally (the sprawling campus environment). Centralized cooling of spaces became commonplace. Windows that had previously been operable became sealed. Also, systems typically ran 24 hours a day. In the early 1960s, building owners began to see value in turning systems off at opportune times. There was a need to centralize control of systems to allow oversight of operation, as well as to control system operation. The control systems that had served so well with capillary sensing could not meet the need for centralized information. In response, the control industry developed the concept known as pneumatic transmission. Pneumatic transmission made the sensor a separate component of the sensor-to-controller-to-controlled device sequence. Pneumatic sensors still sensed the variable; however, instead of being connected directly to the controller, the two components were connected with a pneumatic air pipe. The air pipe could be as long as desired. For example, the sensor or pneumatic transmitter sensed the variable over a fixed range, such as 0°F to 100°F, and created a 3-psig signal at 0°F and a 15-psig signal at 100°F. The signal was linear between the range extremes. For each degree change in the example, the air pressure in the pipe would change by 0.12 psig. The control industry standardized pneumatic transmission and the 3- to 15-psig. pressure change for a sensed range. Now the same sensed variable could be used to control a process at a fan system on the roof and simultaneously to indicate the process condition on a master panel board in the basement. Previously, capillary type sensors were unable to indicate the sensed variable. 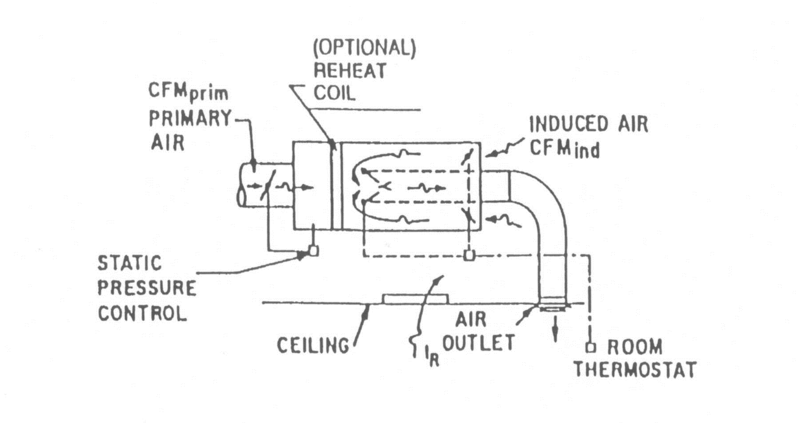 A separate thermometer or hygrometer was needed adjacent to the duct-mounted controller to observe the variable. With transmission, the same sensor could be connected to a separate receiver controller as well as to a specially calibrated gauge that read in units of the sensed variable rather than in pressure. The receiving controllers as well as the gauges could be centralized in mechanical equipment rooms in control panels. Pneumatic transmission was widely accepted in the building industry and currently has been the most common type of control system installed in campus buildings. The introduction of transmission and the flexibility of this concept introduced much greater complexity to buildings. A wide range of new control logic applications appeared as the sensed variable was made available for manipulation. Comparisons could be made of the lowest temperature, the highest pressure, and the humidity in various locations. Different receiver controllers, with different set points for daytime or nighttime, winter or summer, could be switched in and out of the control logic. The inclusion of time control clocks and interconnection to a wider range of electric devices, such as switches and lights, made the systems electro-pneumatic rather than pure pneumatic, as in earlier years. As controller complexity increased, the ability to understand building system controls decreased. In years past, a typical building had six different types of devices that were used repeatedly to make up a control system. Now there were hundreds of choices of products. To address the change in technology, the building engineer who typically oversaw controls was replaced by control system specialists and technicians. As systems became more and more sophisticated, the shortcomings of pneumatic transmission became clear. Pneumatic controllers lacked long-term reliability, requiring frequent inspection and recalibration to achieve the needed reliability. Control rooms and centralized monitoring became important to oversee the proper operation of the controls. A new need developed as control complexity grew and the need to centralize oversight became commonplace. The cost to bring hundreds of wires and air lines to one central location grew significantly. The industry began to offer a lower-cost system that could accomplish centralization without the numerous individual components. This product was the building monitoring system. 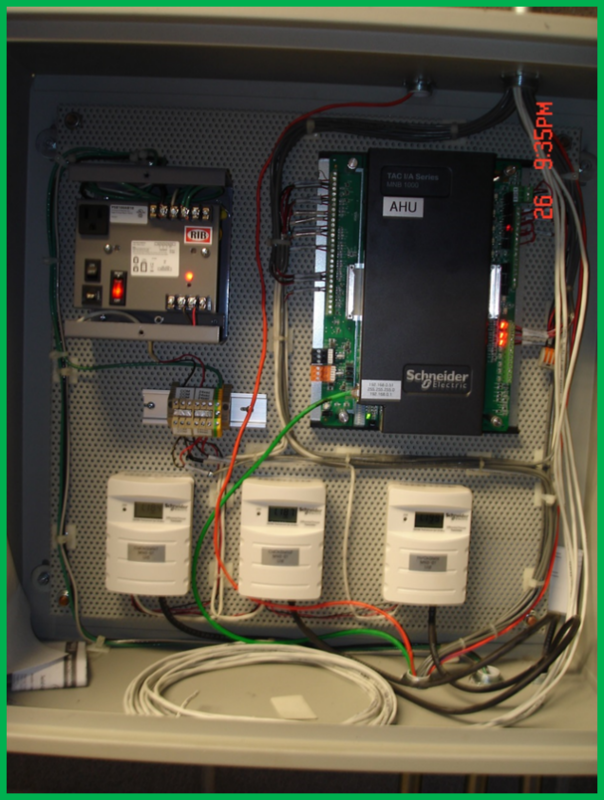 Building monitoring systems started as multiplexed wiring systems. Multiplexing allowed numerous signals to be sent over a cable made up of many small wires. The central multiplexer switcher would select a pair of wires to read a value and sense another pair of wires to connect the sensor. The multiplexer was then connected to one common gauge at the central control panel. In a similar manner, an operator could select a motor or function at a remote mechanical location and cause it to start or stop, all over the same sets of wires. It became apparent that initial multiplexers were dependent on the console operator as they became more and more complex. Again, the industry responded in the late 1960s with the marriage of the general purpose digital computer and the multiplexing systems. The combination of the computer with the building monitoring function gave building owners new flexibility. Until that point, all knowledge was contained in the personal memory of the building maintenance staff. Now memory in the computer could maintain this knowledge. The computer could also reproduce the manual actions of operators to interrogate systems and to start and stop system functions. Systems could be interrogated, conditions compared with stored ideals, and exception reports prepared. Computerized systems could free building maintenance staff to perform other duties. The early systems were quite crude by current standards; however, they offered necessary features, and further advancements created modern building monitoring and control systems. Building monitoring and control systems that sprang from the early combinations of controls were a part of the continuing evolution of building control systems. Significant changes to systems occurred in the early 1970s. Computing power was increasing dramatically while computing costs were decreasing. The integrated circuit helped lower the cost of developing sophisticated circuitry, and improved systems software became more user friendly. Installation techniques for systems became less costly. Building monitoring and control systems were being recognized as a necessary part of managing large facilities. The development of building monitoring and control systems was influenced most significantly by the development of system software and the energy crises of the 1970s. As ASHRAE 90 was first published in 1975, and as energy-efficient buildings became expected, it was apparent that buildings needed to be operated more intelligently. A strong need developed for applying control algorithms with greater logic than mechanical-only control systems could provide. Thus, in the late 1970s and into the early 1980s, the use of a powerful central computer and software specially developed to manage facilities needs pushed facilities management into a wide array of new areas. Systems had previously managed environmental conditions, but began to include the management of allied building systems, such as fire alarms, security reporting, access management, lighting control, and even facilities maintenance. Control had historically addressed comfort and the environment, but systems were now being applied more and more to facilities integration. The trend continued into the mid-1980s, when the development of the microprocessor, the availability of inexpensive computer memory, and the large-scale integration of electronic circuits ended the period of pneumatic control. The period of digital control had begun. Until the mid-1980s, buildings typically had two control systems. The actual operation of the systems was accomplished by pneumatic control systems. The oversight of systems and the reporting of exceptional circumstances, such as emergencies and off-normal conditions, were typically accomplished by a second system. The two systems had points of interaction, but they could operate independently. Digital control completely changed this design. In early control systems, determination of the sensed variable, such as temperature and humidity, was done with pneumatic transmission. Pneumatic sensing still relied on the principle of temperature or humidity causing motion, which allowed a variation in a signal. Pneumatic controllers used levers and springs to create amplification of signals and comparison of conditions to the set point to create control. The common theme was that mechanical motion was intrinsic to controls. Digital control used the microprocessor as the controller, relying on electronic sensors whose electronic properties change in the presence of temperature, humidity, or pressure. There were no longer any moving parts. Digital control systems used one common digital controller for the numerous control loops present in an area. All sensors connected to one controller, rather than the numerous ones that were required for pneumatic control. Different manufacturers developed control panels to accommodate a few control loops or many loops. The significant difference was in the software. Whereas control logic was accomplished in pneumatic systems with the addition of components, now additional control logic could be created with software. In addition, digital control systems shared input data as needed. In the past the pneumatic system needed an input, and the building monitoring and control system needed a separate input. Now the digital controller could use the same input device, typically known as a point, to operate the local control loop and report to the central monitoring system. Digital control systems often retained the pneumatic actuation used in pneumatic control, because it was inexpensive and reliable. Digital control systems typically sensed and controlled with digital electronic logic, and then transduced signals to provide pneumatic outputs to the controlled devices. The period where buildings had two systems for control ended with digital control. The first digital control systems typically were known as stand-alone systems. Initial systems were central-system based and required that every point be “hard-wired” back to the computer. As systems progressed and computer systems became smaller (microprocessor technology), it became feasible to distribute the intelligence of the system. With further development, complete independence of remote panels become feasible. As the networking capability progressed and bandwidth expanded, these capabilities began to improve direct digital control's (DDC’s) ability to communicate between remote panels and to a central computer. It became apparent that there were economies available if certain information could be shared. Input points such as the outdoor air conditions, pressures at various locations within the building, and fire safety information could be used at all control locations. While the first systems were unable to share this information, networked systems made all information available to all systems. Another advance for DDC was improvements in the interfaces for communicating with the staff. Graphical User Interfaces (GUIs) provided visual images of the various controlled systems with data directly readable on the screen. Entire systems could be viewed at once and operational decisions could be made more easily. Today, virtually all manufacturers provide equivalent technology with stand-alone remote panels, central computer control, and monitoring using GUIs. With increased computing power and decreased data storage costs, it is now possible to record, trend, and graph many variables. Thus, there is now the ability to monitor systems when no one is present and to review the data at one’s convenience. Graphical presentation of the data allows staff to quickly notice anomalies and to study cause and effect on the operation of the system. If buildings are provided with individual utility metering, then this data can be collected and analyzed and compared to other operating variables or shared publicly through various means. Systems can be fine-tuned; experimental operational strategies can be tried and the results easily monitored. Systems can even be monitored by a third party where a contracted service monitors and provides advice on operations and efficiencies. More recently, with the reduction in costs, DDC is now being applied at the room level. A small microprocessor now can control individual rooms, with the information about the room transmitted back to the remote panel and ultimately back to the central monitoring station. As a result, we now have the capability to monitor and control individual rooms. For example, if a faculty member goes on sabbatical, their office temperature could be remotely reset to save energy. In some cases, not all input points are used at the space level, so additional control functions can be implemented at the room level. For example, the operable window position could be monitored and the heating and cooling system for the space turned off if the window is open. If the window is accidently left open overnight, the DDC system could monitor the space temperature and turn on the heat if the space gets too cold. As the interoperability of various systems and communication protocols become more integrated DDC systems are being expanded to include lighting controls, access and security systems and utility data. For example, DDC manufacturers are making their own lighting panels so scheduling can be done for both HVAC and lighting from one system or light switches can be tied to the space HVAC system to bring the system up when the lights are turned on or occupancy is sensed. Access control systems can also be tied to the building DDC to coordinate access with HVAC and lighting operation. These examples are just a few of the ways interoperability can be implemented. Most recently, Web-based tools allow access to the systems and provide reporting capabilities that were unheard of before the development of the Internet. Instead of having a central location for monitoring the system, system operations can be monitored and analyzed from a desk (or a home computer). Emergencies can be reported via cell phones and other Web-enabled devices. The application of computer power and the virtually limitless capability of applying logic to building systems control have opened up all kinds of possibilities. For example, the old night setback strategy was based on a time clock that turned off the heat at night and turned it back on at a preset time. While that function could be duplicated, computer technology can check outside air temperatures and inside temperatures and calculate when to start the heating system so that it runs no longer than necessary. In fact, one could go a step further. The system has the capability of checking on itself by seeing if the required space temperatures have been reached by a specified time. If not, the computer can adjust its calculations and try again the next day. Thus, the system continuously makes adjustments until it gets it right. Too often, as buildings are retrofitted, the old pneumatic-based strategy is just duplicated in the logic of the DDC and the true power of the system is not realized. It is clear that converting from old building control technologies is cost effective. The rate of return on investment is realized through the implementation of many new control strategies and reduced maintenance costs, but only if the implementation truly takes advantage of the power of DDC. Currently, most campuses typically have three types of systems: pneumatic transmission systems, the overlay of a building monitoring and control system, and some digital control systems. The facilities manager must understand these systems, their functions, and resources used as aids in management. A facilities manager should have a strategy for control system management. Because these systems have the ability to affect comfort, environmental quality, and energy use, maintenance of these systems continues to be important. The maintenance strategy should include a strategy for understanding the systems, a strategy for maintaining the systems, and a strategy for replacing the systems at the conclusion of their useful life. Campus systems have controls installed over a wide range of years. 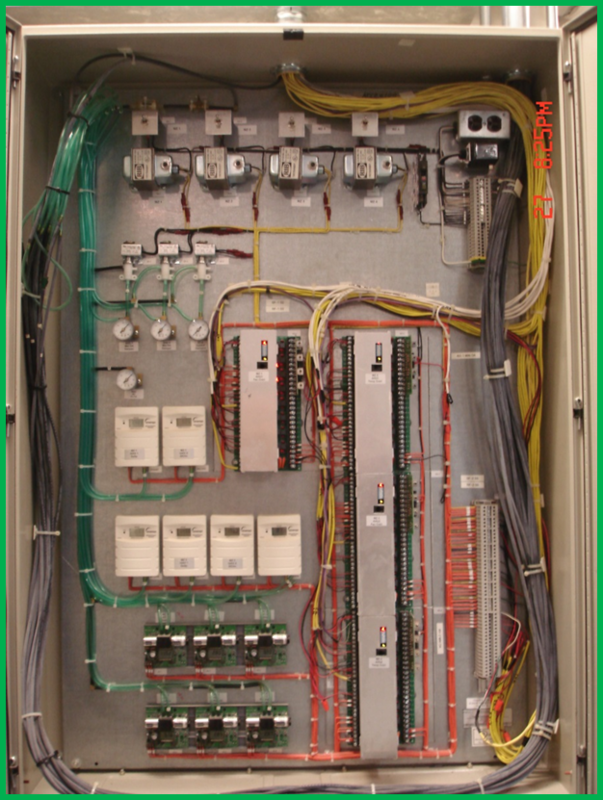 These control installations have typically been done by local control installation vendors representing major manufacturers. In many cases, the manufacturers themselves have local installation branch offices and have installed the systems. The control system suppliers can be a facilities manager's biggest resource in receiving value from the operation of control systems. The operating staff within facilities should have a well-developed relationship with the control system suppliers. Suppliers offer a wide array of training opportunities, ranging from pamphlets and books to training at the vendor's headquarters. In addition to training, control suppliers have traditionally documented the systems controls and the operation of the system in documents known in the industry as control drawings. These drawings are fundamental for facilities managers to understand system operation. In certain cases these drawings represent the only remaining documentation of original design intent and operation. Control drawings should be obtained for every campus system. They should be maintained in a library and made available to service and vendor staff. In addition, the drawings should be reproduced and placed at each system location so that technicians can more easily understand and more rapidly repair the control systems. In the library, staff should also create a summary of control components. Manufacturers prepare individual catalog description sheets for each control component they manufacture; these components change as years pass. The installed base of components should be maintained on site to allow the staff to learn the specifics of installed products. The control systems on campus do take maintenance. Older pneumatic systems, particularly those using pneumatic transmission, require the most frequent attention. At a minimum, pneumatic systems must be calibrated semiannually. Calibration is required for each sensor, each controller, and each controlled device. It is recommended that attention be given to each major system before the cooling season and before the heating season. Because of the intrinsic nature of the mechanical components in pneumatic devices, they drift away from their original settings and must be reset. Building monitoring and control systems also need regular maintenance. Earlier systems had less reliable electronics and required maintenance of field components such as servo controllers, power supplies, and filters. Digital control systems and modern monitoring systems have been designed with greater reliability; however, they still must receive modest attention to maintain their value. To manage the systems, the facilities manager must decide whether to use campus staff to service the systems or to contract with suppliers for operation and maintenance of the systems. Each choice deserves thought. On small campuses, staffing is often limited. The staff assume the roles of generalists. They need to know about a wide range of topics and probably will not be experts on any one topic. Control systems require experts to be effective. When a campus cannot retain an expert, it is advisable to work with a local supplier to obtain maintenance services. Control suppliers will prepare a wide range of choices for selection. These choices range from total care of systems, including parts and emergency service, for one annual cost, to occasional system inspection and oversight of in-house staff. On larger campuses, there are typically enough systems to justify the establishment of in-house expertise. With the various vintages and suppliers found on campuses, continual training of in-house staff is needed to maintain competency. The facilities manager may wish to use a compromise strategy, employing a control system supplier for more complex technology and using in-house staff for simpler control applications. A facilities manager must make a decision about the number of system vendors that the campus will permit. During the period of pneumatic controls, vendor parts were interchangeable between system controllers, pneumatic room thermostats, pneumatic transmission devices, and controllers. With the advent of building monitoring and control systems, this interchangeability ended. Manufacturers created systems that were proprietary, and the ability to interconnect one system to another was lost. This has created quite a dilemma for facilities managers. Building monitoring and control systems and the more modern distributed digital control systems are often used for purposes other than simply controlling the environment. The systems relay fire alarm conditions, dispatch fire departments, alert safety staff to security breaches, alert service staff to alarms, and generate facilities condition reports. This process becomes more difficult with multiple suppliers of centralized systems. It can still be accomplished, but information and capability may be lost. In addition, the inclusion of each new and different system will create a need for greater training of service staff and a need to maintain an inventory of parts to support each system. The facilities manager must balance the need to maintain a competitive bidding environment with the greater internal costs for operating and maintaining multiple systems. An additional management strategy for campus control systems is the need to upgrade to higher capability systems. Older pneumatic transmission systems have a finite life. Controllers and sensors begin to fail as these systems age, and associated control components become less reliable and accurate. Eventually the system will need renewal. Many building monitoring and control systems were installed in the early 1980s, and these systems are slowly being made obsolete by their manufacturers in favor of higher capability distributed digital control systems. Some suppliers have created newer versions of old systems that enable older versions to be incorporated in overall system operation, allowing incremental upgrades. Other suppliers have not planned for upgrades, and systems must be totally replaced. A well-thought-out strategy can assist the facilities manager in maintaining facilities management continuity and budgeting needs for the future. The application of controls to building systems is a career unto itself. This section cannot offer expertise on every strategy for the control of mechanical and electrical systems. For additional expertise, readers are referred to the 1995 ASHRAE Handbook of Heating, Ventilating, and Air Conditioning Applications (see www.ashrae.org). Controls are best applied with knowledge of the intent of the mechanical system design. What is the expected result? What are the seasonal changes to the control logic? What are the occupancy implications that affect control? The facilities manager cannot expect to be an expert on every application. It is recommended that a competent engineer be used for specific application guidance. The facilities manager can take the more valuable role of representing the users and maintainers of the building. In past years, there was a temptation on the part of control suppliers and users to allow controls to dictate the design of a system. The facilities manager should avoid the temptation to over-control a space. One way to avoid inappropriate control applications is by establishing facilities standards. How will controls be applied to similar situations? Nothing frustrates operating staff more than the random trial of solutions to similar needs. Find a solution that works well and avoid the temptation to try the newest method. Experience has shown that building operation staff will reduce the complexity of a system to their level of understanding. If controls are allowed to become overly complex, the operating staff may negate some of the complexity in favor of increasing understanding. Be aware of the knowledge level of the staff. The best strategy to impose on staff or consultants who are designing systems is simplicity. A second role of the facilities manager is to create an understanding of the quality of the control systems. Like all purchases, there are choices in the level of quality available in controls. The quality of the controls can have a significant impact. Accuracy is vital if the control system is being used to meter energy to a facility and this energy is a source of income to the institution. Similarly, the accuracy of the controls is vital to the success of the building users if the controls are preventing the migration of contaminants from one space to another in a research laboratory. The facilities manager should research the quality issues pertinent to a design in progress. What are the limitations of the proposed systems? Do the proposed controls provide the needed accuracy? Are proposed systems compatible with existing systems on campus? If there are wider-reaching future plans for the campus or further building integration, can the proposed systems meet these future needs, or will they become "white elephants"? In addition to the selection of quality control system products, there is the analysis of the local service capability of the control supplier. The facilities manager should research service support available in the locality. Is there a local service commitment, or are there only a few service agents nationally? Are spare parts warehoused locally, or are parts available only with a wait of several days or weeks? Can the supplier provide the necessary staff training? Are there locally satisfied customers? Does the supplier have expertise in campus applications? The facilities manager must qualify the suppliers to be certain that in times of need, the supplier will be available for assistance. As control systems are proposed, the facilities manager should understand the needs of the users to determine whether the systems are adequate. What do the users need? Are there critical spaces that need to be monitored? Are there significant flows that must be maintained? What is needed in the event of an emergency? What systems must be integrated to accomplish the desired result in facilities operation? The facilities manager should also check to see that facilities standards have been followed in the proposed applications. Does every space where an employee works have some control? Does the design comply with appropriate regulatory issues, such as air exchange rates and fume removal? The role of the facilities manager in the application of controls is best described as oversight. Controls have been offered as a solution to higher energy costs on campus. The facilities manager should approach the use of controls to achieve energy use with caution. Controls can reduce energy use in facilities; however, the facilities manager should understand that energy reduction can be achieved with a variety of strategies. In most cases, campus involvement and commitment will achieve the greatest energy reductions. Heating and cooling controls are only one strategy to be considered. Perhaps the biggest error in applying direct digital control (DDC) strategies is simply overlaying or implementing the same control algorithms used in the legacy systems. Computer-based DDC is limited only by the imagination of the implementation engineer, and the power of the computer should be used to its full advantage. The best strategy for reducing energy consumption in building systems is through sound engineering practices. Controls can merely manage mechanical processes that are in place. Engineering evaluation can review the process. As an example, there is a control cycle known as duty cycling. Duty cycling can be applied where two pieces of equipment supply the same function but only one is needed at a time. An example would be heating pumps where there are two pumps but only one needs to run most of the time. If additional heat is needed the second pump will come on and provide additional heat. In this case the first pump is the primary pump and the backup pump is the secondary pump. If the first pump is always the primary pump it will run many more hours than the secondary pump. With duty cycling the roles of the pumps are reversed based on a predetermined algorithm such as calendar time or runtime. Thus the “duty” of the pumps is cycled. If a system is soundly engineered, there are legitimate control strategies that should be applied by facilities managers. The greatest savings available from controls is through coordination of energy use. Just as original control systems coordinated energy use in simple buildings, modern control systems coordinate energy use in complex buildings using the principle of feedback to create coordination. As various control strategies are applied, the facilities manager must always keep the phrase "meet the needs of the occupant" in mind. The best energy conservation is to simply turn off energy-consuming equipment. This most likely will not meet the needs of the occupants. Thus, it is really an optimization process, not a minimization process. The facilities manager must determine the energy use philosophy for the campus. Will energy reduction have a high priority, or will the needs of the user have a higher priority? When it is appropriate to use control systems to reduce energy, a user can choose a number of strategies. The best strategy for conservation is the implementation of an unoccupied period control. This strategy turns off equipment when the building is not in use. Facilities are seldom used 24 hours per day, 365 days per year. When the staff is not using the facility, non-safety-impacting equipment should be turned off. This can be done through a simple time clock or preferably through the monitoring and control system. This strategy not only significantly reduces energy consumption, but also extends the life of the equipment. In areas where weather extremes may cause the building to become too cold or too hot when unoccupied, a feedback thermostat is needed to restart the equipment to keep building conditions within limits. With digital control now used at the individual room level occupancy sensing can be implemented at that level. In this case there are two variations; occupancy sensing and vacancy sensing. With an occupancy sensor the lights and, if tied together, the HVAC come on when a person enters the room. When the person leaves the room, after a preset time delay, the lights and HVAC will go off. This type of function is useful for restrooms, storerooms, etc. With a vacancy sensor the HVAC will come on when the person enters the room but the lights will not come on unless the person physically turns them on. When the person leaves the room, after a preset time delay, the lights and HVAC will go off. This functionality is useful in spaces that have natural light and don’t always need to have the lights turned on and thus will save more energy than using an occupancy sensor. In a typical facility, each occupied room should have an individual control. Typically there is a ducted system delivering air to the room, and a locally controlled device such as a baseboard heater or cooler. Just as it is important to turn off central equipment, it is important to reduce or increase the set point of the individual room thermostats. These thermostats will reduce energy consumption during weather extremes. Equipment that has been turned off because the building has been unoccupied must be restarted at a time that will restore the building environmental condition before staff arrive. In a simple manner, a time clock can be set for a predetermined time. However, the time selected will always be the longest period that results in acceptable conditions. Compensated start-up observes the weather outdoors and the temperature indoors and determines the best start time. As weather conditions change, the start time changes to minimize system operation. The electrical usage of a campus varies randomly. There are times when all users draw power at the same time. To meet the demand, the local power company must have power generation and power transmission capacity in place. The power bill a campus receives includes a charge for this reserve capacity. Control systems can minimize this billing by reducing demand during certain peak demand periods. This can be done only with a central monitoring and control system. The system measures campus demand and cycles off deferrable loads until the peak period has passed. The loads are automatically restored at the conclusion of the peak. Demand control strategy must be approached with caution, as it is only effective on campuses with a large number of deferrable loads and high peak demand charges. In general, the only campuses that have found this strategy to be effective are those that have large electric-driven chillers that can be duty cycled. Load shedding consists of turning off loads during their normal operating times for a prescribed period and then restoring the loads. This strategy will result in savings on loads that are eligible for cycling. The facilities manager should exercise caution in the selection of eligible loads, as the frequent starting and stopping of loads in certain cases will cause premature motor and drive failures. Also note that load shedding does not necessarily save energy, it just defers the expenditure of energy to ultimately deal with the load. For example, a common load shedding strategy is shut down cooling equipment for a set period of time. However, the cooling load still exists and is building up until the cooling equipment is turned back and can deal with the stored cooling load. Certain buildings cannot have entire systems turned off. In these facilities, it may be possible to create common-use zones. With proper modification of system piping or air distribution equipment, it may be possible to turn portions of systems off while keeping the remainder of the system in operation. Zoning should be reviewed by an engineer to be certain that airflows and water flows are operating properly if zoning is added to an existing building. Campuses typically have three “time zones”; the 8:00 a.m. to 5:00 p.m. time zone (offices), the 8:00 a.m. to 10:00 p.m. time zone (classrooms) and the 24/7 time zone (labs). If each time zone can be confined to one area of a building then the heating and cooling systems can be connected to the appropriate zone without having to operate outside that time zones normal hours. With the advent of digital control, it is possible to add the individual room environment control to the building monitoring and control system. This offers managers a new option: individual space operation. These parameters can be adjusted with digital information available to the central system. Weather-related changes can be made to airflow minimums and maximums, and room set points can be altered for seasons. The space operation can be altered to match the operating schedule of the occupant. If a person lunches from noon until 1:00 pm, the system air can be turned off for this period without affecting the user. If a professor vacates an office during class and laboratory hours, the system can be adjusted. Individual space operation offers a new dimension in energy reduction possibilities and at a finer level of control. Systems in buildings often have operating set points that are determined by operation during extreme conditions. In milder weather and when unoccupied, these settings can be automatically adjusted to minimize energy use. To accomplish this adjustment, a control system must read the need of selected rooms within the building and signal the central controller to adjust the set points. A common strategy is to setback temperatures. For example, if it is -20° F outside the heating hot water temperature might be set at 130° F. But if it is 40° F outside then maybe the heating hot water temperature might be set at 90° F, thus saving energy. Outdoor air needs to be introduced to buildings in order to ensure the health and safety of the occupants. Standards have been set by such organizations as ASHRAE (Standard 62). In most cases the ventilation requirements for the types of spaces found in institutions of higher education are based on the occupancy level and floor area. Heating and cooling outdoor air can be very expensive and energy intensive and there are various methods to reduce the impact of meeting ventilation requirements. For example, in many areas there are periods of good outdoor air conditions where no heating or cooling is required. In this case the outside air dampers can be opened fully and the good air brought in to ventilate. The calculation to determine whether the outdoor air (compared to the indoor air) can be based on the dry bulb temperature (dry bulb economizer) or the enthalpy of the air (true economizer). In some cases night time air temperatures (or enthalpy) are at a level that allows pre-cooling of spaces before occupancy the next day. CO2 has proven to be a good indicator of occupancy levels and as CO2 sensors have improved they have allowed new control strategies to be considered. There are still control issues associated with CO2 sensor placement and monitoring as control of ventilation levels may cause over or under ventilating but it is generally recognized that it is an improvement over other strategies. 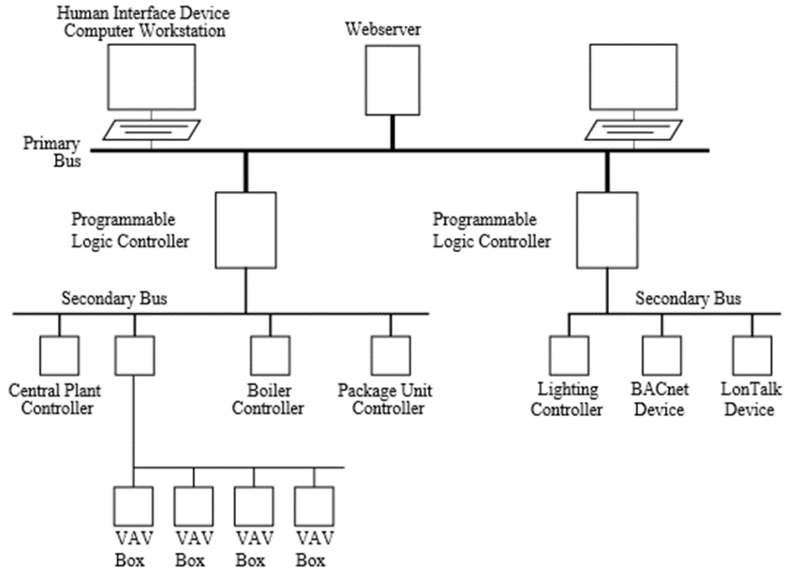 It is not possible to cover all aspects of control design, but there are some common practices. This section will cover several concepts that are applicable beyond the examples given here. Control modes can be implemented in a variety of ways. A typical mode is the two-position or “On-Off” mode. In this case, the control provides two positions like a light switch, where the light is either on or off; in the case of a control valve, the valve is either open or closed. The use of two-position is relatively straightforward when the source being controlled is not “analog” in nature, like a light switch. However it becomes more complicated if we use a two-position approach where the variable being controlled varies over a range. In Figure 1, if the controlled variable is the temperature of a space, then it will vary over a range. If, for example, the system is in the winter heating mode, a heater would come on if the temperature were too low and it would go off if the temperature were too high. If there is no control differential, the heater will be constantly cycling on and off. To avoid this inefficient cycling, a control differential is introduced: the heating system continues to heat until the space is above the upper limit but does not come back on until the space temperature is below the lower limit. This type of control is used quite often in spaces where a wide temperature range is acceptable, such as in a warehouse. If better control is required, proportional control is an alternative control strategy. In this control mode, a throttling range and a setpoint are set (see Figure 2) for the variable to be controlled. For example, the thermostat may be set at 75°F with a throttling range of 2°F. In this case, the temperature of the space will be allowed to range between 74°F and 76°F. The controller will send a signal to the cooling water valve to open fully if the temperature is at 76°F and to be fully closed if the temperature in the space is at 74°F. If the temperature is somewhere in between, the valve will be “proportionally” open. A characteristic of this control mode is that the temperature never settles out at the setpoint. There is always an offset because a control signal “error” is needed to position the control valve for the load being experienced in the space. Note that the size of the offset will vary depending upon the load. In most cases this small offset is inconsequential, but in certain circumstances the resulting offset may not be acceptable. In circumstances where proportional control is not acceptable, proportional+integral control can be implemented. The word integral comes from the word “time” and implies that over time the control system adds a control input that eliminates the offset. Thus, as the controlled variable settles out over time, it will come to settle on the setpoint as shown in Figure 3. There are circumstances in which the variable is changing faster than is acceptable, or it is not settling onto the setpoint, without an offset, as quickly as required. In this case the proportional+integral+derivative control mode can be implemented. Derivative comes from the concept of “rate” or “rate of change,” thus the faster the variable is changing, the greater a control input must be made to keep the variable within control. This concept is shown in Figure 4. Of interest to the controls specialist is that older control systems relied on mechanical upgrades (read: more expensive) to provide control modes beyond the standard proportional control mode. However, today with direct digital control (DDC), it is only a matter of which equation to implement within the computer. Thus, better, tighter, and more energy efficient strategies are now more readily available. The characteristics of dampers to control air flow should be understood so that they are implemented according to the application. 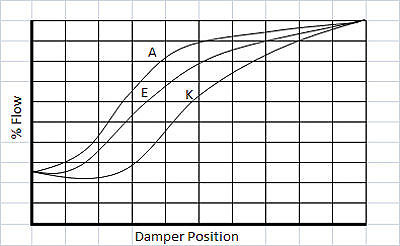 Figure 5 shows the flow characteristics of a parallel blade damper. 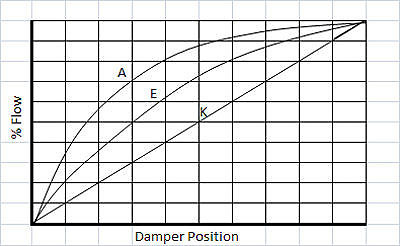 Figure 6 shows the flow characteristics for an opposed blade damper. There does not seem to be a clear reason to pick one over the other, except that they obviously have different flow characteristics. However, as Figure 7 shows, an approximate linear flow characteristic through most of the range of Curve E (always good to ensure a stable control system) is obtained with less pressure drop through a damper using an opposed blade damper. Thus, if the control strategy requires controlling air flow over a range it makes sense to use an opposed blade damper. Parallel blade dampers should be used for “open or closed” applications. It should be noted that with DDC we can actually provide a control algorithm that “linearizes” the control feedback loop process to provide “artificial” stability. This capability was not available before DDC. An important part of piping and control valve design (see Figure 8) is ensuring that the valve is sized appropriately. 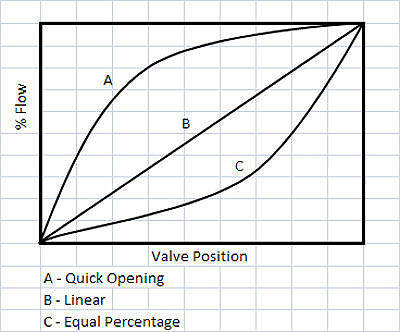 If the valve is oversized, then during low to medium demand the valve will be almost closed. 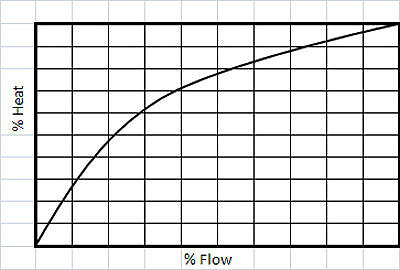 If the operational situation results in a high frequency of low to medium demand, the valve will operate a high percentage of time in the nearly closed position. This will cause damage to the valve seat, commonly known as “wire draw” damage. On the other hand, if the valve is too small, then at the full open position it cannot provide the proper flow for full operation. where the constant Cv is provided by the manufacturer of the valve. The valve size should be chosen with a Cv that ensures the pressure drop in the valve is half the pressure drop through the heat exchanger. Valve type selection is also important when combining the valve with a heat exchanger. 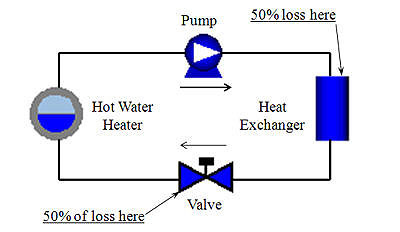 Figure 9 shows the output of a typical hot water heat exchanger. In examining the various valve characteristics of several types of valves (see Figure 10), we can see that we have choices in their characteristics. If we were to match an equal percentage valve with the heat exchanger’s heat output characteristics, we would end up with an overall linear system because the combined characteristics would make the system linear and more stable. Once again, using DDC this system can also be “linearized” to improve stability. These are only a few examples of control characteristics that impact operational issues such as stability, efficiency, and maintenance. The lesson learned here is that component characteristics, be they a valve and heat exchanger, damper blades, or air diffusers, play an important role in the successful overall operation of a system and must be carefully matched to ensure optimal performance. And with the development of DDC, many of these operational issues can also be addressed through sophisticated control algorithms. Ventilation is an important part of ensuring the health and wellness of the building’s occupants. As buildings have become larger and windows are no longer adequate for providing proper ventilation throughout the whole building, systems have been designed to bring outside air into the building. The section on Ventilation Control in this chapter describes control strategies and recommendations. However, just getting the outside air into the building does not necessarily mean the outside air reaches the location of the occupant within the space they occupy. Research has been done to analyze how best to deliver the air into the occupied zone within a space. The result is a variable called the Air Diffusion Performance Index (ADPI). When air is introduced into a space (See Figure A) it is delivered through a diffuser or grill with a certain velocity. This velocity will “throw” the air into the room which will entrain local air and slow down to a terminal velocity. As the air slows down it will move into the room or “drop” differently depending upon whether it is cool air or warm air. The manufacturers of diffusers and grills provide the throw and drop to certain terminal velocities as part of their catalogue data. The terminal velocities chosen are typically 50, 100 or 150 fpm. In addition to the terminal velocity the ADPI uses a term called the “room characteristic length.” This “length” is the distance the air can travel before it is interrupted. It could be a wall opposite the grill or it could be half the distance between two ceiling diffusers (where the two air streams meet). 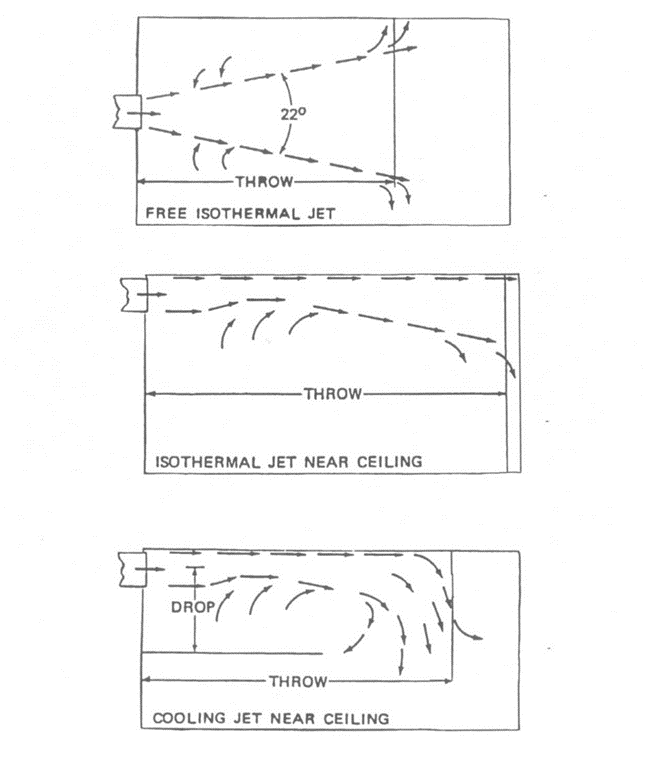 Thus, knowing the throw to a terminal velocity of 50 fpm (shown in Figure B. as T 0.25 - 0.25 meters/second, which is equivalent to 50 fpm) and dividing by the characteristic length (meters) in the direction of the throw the ADPI can be calculated. Figure B. shows the acceptable range of ADPI for various types of diffusers and grills in the heating mode, as that mode is the most challenging. For example, for a Circular Ceiling diffuser the ADPI should be in the range of 1.4 to 2.1. There is a similar chart for diffusers and grills when operating in the cooling mode. The engineer should layout the diffusers or grills based on room characteristic lengths to ensure thermal comfort and diffusion of the outside air into the occupied zone. 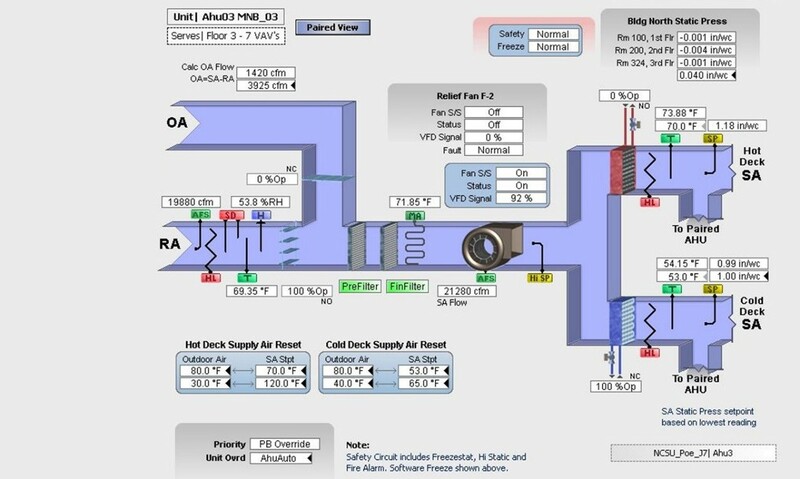 One of the challenges for an engineer is ensuring the ADPI is maintained for a variable air volume (VAV) system. In a simple VAV system the amount of air coming out of a diffuser or grill will vary, thus the velocity will vary and thus the ADPI may not stay within an acceptable range. This shortcoming can be overcome by using an induction type VAV terminal box (Figure C.) or a fan powered VAV box. These types of boxes re-entrain air from the room and add it to the primary air so that the air coming out the outlet remains the same (and so does the velocity) regardless of the primary air flow rate. While it is not important to understand the complexities of the ADPI, it is important to know that engineering research supports a logical layout of diffusers and grills. Proper design of the delivery system into the space is an important part of ensuring thermal and ventilation needs are met. The control systems available give a good indication of the future direction of control systems. The facilities manager should review newer features to determine the value these features will offer. Control systems will continue to integrate systems within buildings. Facilities integration, with the end result of one universal campus system, will continue to incorporate features provided by suppliers. Currently, system suppliers are creating pathways to allow communication between building systems that have not previously been integrated. Fire alarm system, boiler system, air compressor, and air distribution system manufacturers are configuring common control interfaces to connect to the common building monitoring system. As electronics continue to be applied in all aspects of society, the facilities manager should expect to see low-maintenance, high-reliability control systems. In the interest of further integration, the American Society of Heating, Refrigeration, and Air Conditioning Engineers (ASHRAE) commissioned the establishment of the first common communication protocol: Building Automation and Control Net (BACnet). This protocol, under continuous development, will give facilities managers the potential to have various suppliers of systems integrated onto one campus system. LONWORKS is another protocol that has been developed to allow different systems to “talk” to each other. There are open protocol systems such as Modbus, Modbus TCP/IP or OPC as well, which have become standard in specific industries. Historically, control systems have been managed by facilities experts. With improvements in control products, the management of systems will be distributed to the building occupants. Currently, there are personal environmental controllers made for desktops.These controllers place direct control of airflow, temperature, and humidity in the hands of the occupants. In addition, vendor software for systems is reaching out to users. Suppliers are further developing direct interfaces for the personal computer networks common in offices using Web-based software. Terminal devices will communicate wirelessly, decreasing installation costs. Third party software that will work with the DDC system such as space scheduling coordinating with HVAC schedules. There will be continued integration of other building systems with inventive communication strategies. These are areas to keep an eye on. In summary, heating and cooling controls play an integral part in the successful operation of campus facilities. It is important that the staff who operate and maintain these controls be properly trained and kept abreast of the latest developments. A preventive maintenance program must be in place to ensure continued accuracy and reliability. 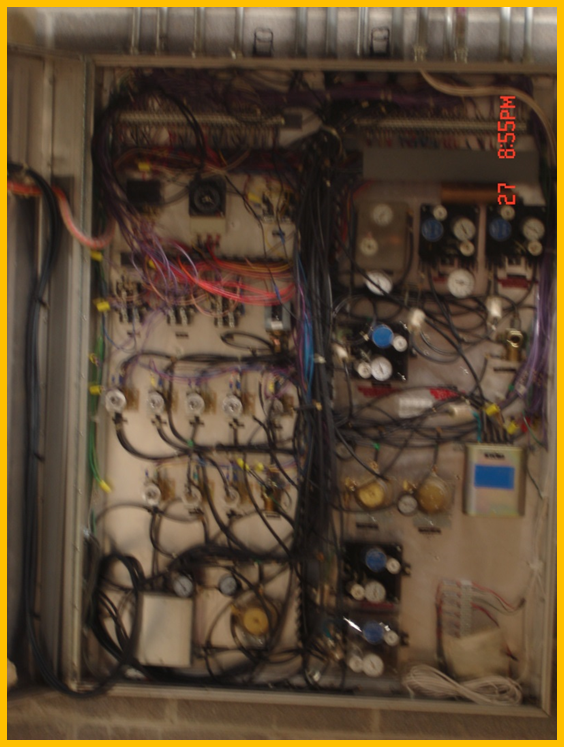 Control systems are only as good as the mechanical and electrical systems they control. Thus, standards should be created and applied early in a project's design to ensure compatibility with need. In addition, new technologies are constantly being developed and integrated into the controls industry. Finally, proper application of control systems depends on the needs of the occupants, which must be thoroughly understood. After all, systems exist for the needs of the occupants. 1. American Society of Heating, Refrigerating, and Air-Conditioning Engineers, Inc. 1995. 1995 ASHRAE Handbook of Heating, Ventilating, and Air Conditioning Applications. Atlanta: ASHRAE. Haines, Roger W. 1983. Control Systems for Heating, Ventilating and Air Conditioning, Third Edition. New York: Van Nostrand Reinhold Co..